Would you like to exit this roof hatch without a railing? This picture is not a fake. It was sent to us by one of our customers. It is a shame to say it, but sometimes safety is not the number one priority when a building is being designed and constructed. Whoever installed this roof hatch was clearly not thinking about the implications of their installation. Do you need a roof hatch railing? 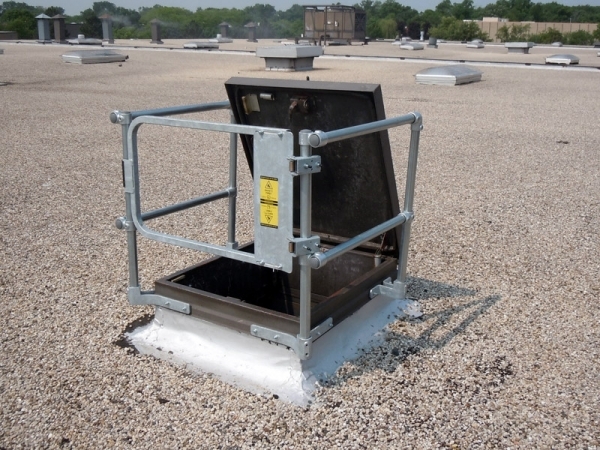 A roof hatch should be protected with a perimeter railing that has a spring loaded industrial safety gate to allow entrance and exit from the hatch. This is a safe roof hatch. 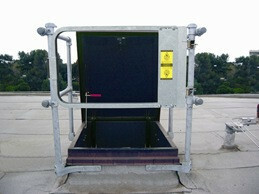 See our Roof Hatch Safety Railing page for more information on protecting your roof hatch. 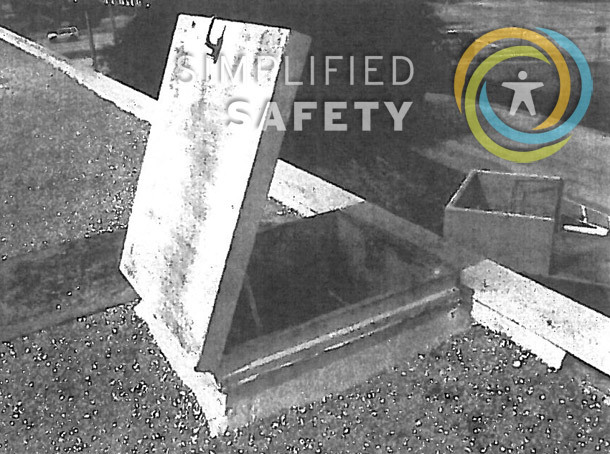 In addition to providing perimeter protection to prevent falls, it also provides a place for the person exiting and entering the hatch to grab onto. This meets the OSHA requirement that calls for the proper grab bars when climbing to the top of a ladder. What about ladder extension bars? 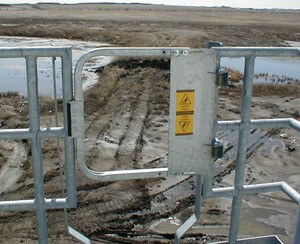 These provide assistance to someone who is entering and exiting the hatch, but they do not provide protection against someone falling into the hatch. How difficult is it to install a roof hatch railing? It's very easy. The KeeHatch Railing is designed to attach to the outside of the hatch with special brackets. In a couple of hours you will have the hatch railing attached and ready to use. Is it compatible with all roof hatch types? Yes! When you place your order we will ask questions about the exact type and dimensions of your roof hatch. The railing uses standard pipe that can be cut to size on site. Be sure to select the style that matches the configuration of your hatch. What materials is the KeeHatch Railing available in? It is available in galvanized steel and aluminum. Both versions are very durable and do not rely on paint for corrosion resistance. Get in touch with our sales engineers and we will be happy to answer any questions you have about KeeHatch or any other railing system.